The adventurers were somewhat surprised that their decision to take a rest after all the hard fighting of the last few sessions didn’t end with something trying to eat them. I do try to keep the pace of adventuring going as it’s quite easy for sessions to get bogged down in spell lists, but I wanted them to have half a chance in the encounters to come as they’re getting closer to the final encounters of this section. Despite that, we did see another character death this week – but it was a total contrast to the demise of Koff the Barbarian. Rather than a moment of abject horror and strategic determination, this week’s death came from selfless heroism. Suitably cautious, they decided to keep searching the level, looking for a clue to the deciphering of the two pyramids that they had so far found. They soon found that they weren’t the only ones to have this idea. A self-locking room was soon discovered, scattered with the remains of at least a dozen Emerald Claw soldiers before an ornate iron door. A strange glow and rising mist from their bodies suggested something unpleasantly necromantic had just taken place. Various checks against arcane knowledge were made to try and identify the effect without getting too close, with guesses ranging from poison gas to free-roaming magical spells such as the ones encountered in the Mournlands. A particularly good skill check roll made me relent and suggest that it looked like the after effects of a banshee’s wail. In quick order, a silence spell was cast on a piece of rocky debris gathered from a ruined outer room and given to Kurtis to see if it would protect him from a sonic-based trap. Rather weirded out by the situation, he didn’t even attempt to get close enough to pick any locks or search for trap mechanisms, but instead got near enough to roll the stone to just by the door before retreating. Some hurried discussions then took place before a Knock spell effect from an item retrieved from Whitehearth was used to unlock the door from a distance. An ominous glow could be seen emanating from components in the door, so Bumperklart was sent in to pull open the door and see what was beyond it. There was a nervous moment when I asked him to make a Fortitude check, which he failed. Which was when I told him it was just as well they’d put a silence zone around a sound-based trap. The relief was palpable, and they all piled in to see what was in the vault. A reliquary inside the vault contained a giant scrimshawed tooth, which shrank to more human proportions when Bumperklart touched it. To everyone’s intrigued horror he chose to fit it into a gap in his own teeth (I asked him to fail another Fortitude check to see if he’d had any teeth knocked out in the recent epic battles – turned out he’d lost at least one from being bashed by the giant skeletons). After some whizzy magical sparkly effects he seemed to be okay, and had gained some minor linguistics based powers. Carvings in the room and area suggested the tooth was a minor artifact relating to the giant mage and artificer who had built this temple. 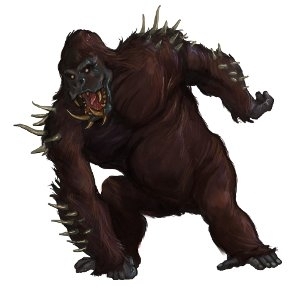 Relieved to have dodged several unpleasant outcomes, the party made their way further round the complex and peered through a large window, disturbing the Dire Apes patrolling the area. A rapid lightning blast called down by Keill on the nearest apes angered the whole troupe and angry armoured and enhanced apes began to close in on the party. With the whole party scattered rather than in their usual more tactical formation, the usual tactic of putting Bumperklart right up at the front to weather the incoming attacks long enough for the spell casters to lay down suppressing fire just wasn’t going to work, so Theo the Bard stepped forward into the large window space to hold the nearest entry point. Drawing his blade, he lashed out, but failed to make much impression on it, which was where it all went horribly wrong. You see, Bards as a class are a highly versatile bunch, able to fight a bit, sneak around a bit, cast spells a bit and excel at supporting the efforts of other classes. The problem is that they just aren’t as durable as the combat monsters like Bumperklart whose skill sets are based around taking incoming damage and dishing out more so that he’s the last one standing – or at least occasionally leaning. The Dire Ape had been standing right next to the window, so was able to get a full attack on Theo, hitting with both claws and biting. There was a momentary pause in which Theo said “Guys, I’m really hurt.” and then I applied the rend damage which the apes inflict if they hit with both claws. Theo was torn apart, spattering those he had stood to defend in his blood. That’s when the fighting got serious – with Bumperklart managing to catch up and block the apes from getting any further in. At the next window down, Kurtis hid in the shadows and back-stabbed each ape as they came in, with Darmon’s spells weakening each of their attackers enough that the tide began to turn. 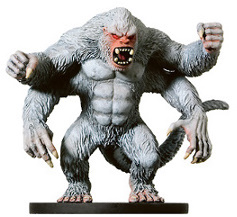 More apes kept coming, attracted by the noise, and then the group’s leader a four-armed Girallon. This monstrous aberration clambered around the walls to leap past Ruin and Gear’s rearguard action and bring the fight right to the centre of things. With Ruin and Gear both badly wounded, Darmon perilously close to physical danger and Bumperklart working with Keill and Quilynn to hold the main assault things looked dicey until they managed to put their attackers down for good. We wrapped up with a quick search of the apes’ resting place in a nearby chamber before calling it a night and spending some time quickly identifying and assaying treasures found so far. As an interesting side note, the highest body counts of the session were tied between Bumperklart and Kurtis, showing what playing to your respective strengths can do in these games. Bumperklart’s straight forward tank and assault allowed him to carve his way through all comers, while Kurtis’ stealth and canny placement just inside a window gave him free reign to surprise and take out a string of apes in quick succession with precision strikes. I have a plan already in place for Theo’s replacement to be able to be on the scene without straining credulity, so I wait to see what will arrive in my mailbox soon.